Magnificent platinum Art Deco diamond ring with huge untreated ruby of 13.5 crt: Description by Adin Antique Jewelry. 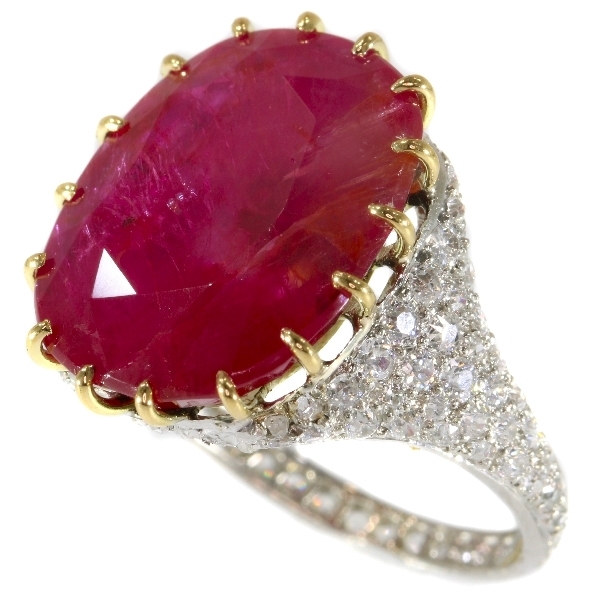 When untreated rubies of over 10 carats weight are a rarity, imagine what this 13½ carat untreated ruby must be then! Thirteen carat fifty two, is huge! Set in a special made ring that is covered with brilliant cut diamonds at all the ring's available outer places, makes you look again, and again, and again. Smooth to wear cause low on the hand. When you Google "eye candy", Google should offer you this ring as first choice. If not, then it's a obvious error in Google's algorithm. Diamond(s): ± 100 old mine brilliant cut diamonds with an estimated weight of ± 1.50ct. (colour and clarity: G/I, vs/si). Precious stones: One natural untreated (!) ruby with a weight of 13.52ct. Birthstones: Ruby is the birthstone (or month stone) for July and diamond for April. Hallmarks: "PT 950" and "Hast", "Mast" or "Rast" (the first letter is hard to read) indicating the ring to be platinum and the maker to be the this "*ast".